We welcome opportunities to link identities with conservation-minded organizations in our community, and happily acknowledge their partnerships in our publications and materials. We see these relationships as a classic win-win scenario, raising public awareness for sponsors while generating much-needed funding for the ongoing work of the Greenway Trust. Read below for available sponsorship opportunities. For more information, or to become a sponsor, contact Mike Woodsum at michael.woodsum@mtsgreenway.org or at 206.382.5565. 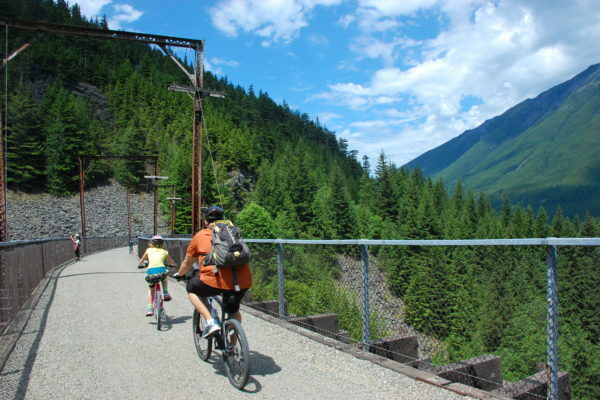 Explore the Greenway is your gateway to enjoy the beautiful Mountains to Sound Greenway through year-round attractions, events, and recreation opportunities. Whether you’re looking to hike or bike a nearby trail, attend a local festival, or learn about this region at a historical site, Explore the Greenway has something for you! The Greenway Trust also organizes several Explore the Greenway Trips each summer that invite community members to get to know the beautiful natural landscape that surrounds us. By supporting year-round events, activities, and resources, our partners recognize the value of building community in the Greenway, as well as building awareness of our work to preserve natural spaces in balance with a growing population. Organizations can support Explore the Greenway as an Event Sponsor or a Year-Round Sponsor. 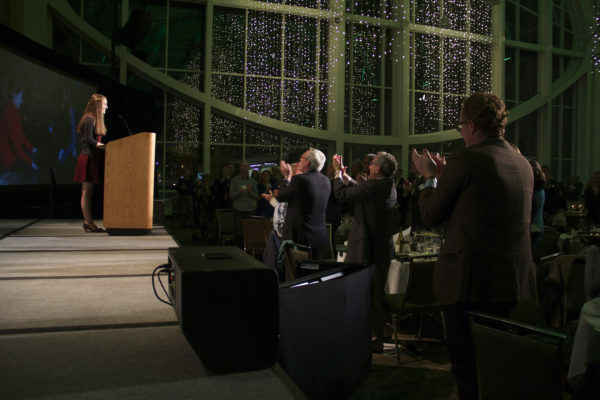 The Greenway Annual Dinner brings together supporters from across the region to celebrate the collective accomplishments we have made in land conservation, ecological restoration, recreation projects, and connecting people with nature over the past year. This event is held at the Washington State Convention Center’s skybridge, overlooking downtown Seattle. Nearly 400 guests come from all corners of the Greenway coalition – corporate and civic leaders, nonprofit partners, agency staff, forest rangers, and trail crews. All are united by the ethos that when we have meaningful connections with our natural surroundings, we are healthier and happier; and our communities are stronger and more equitable; our lives are better. Sponsors are recognized prominently throughout the event and in accompanying materials. 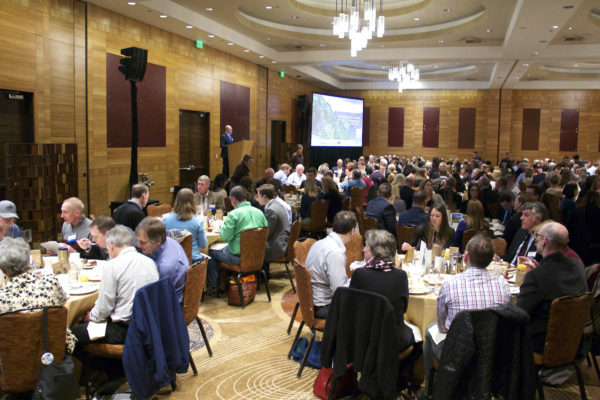 Each spring at the Hyatt at Olive 8 in downtown Seattle, dedicated supporters and people who are brand new to the Greenway Trust join together for the Greenway Breakfast. Together, we discuss the challenges facing the landscape, and how we can implement collaborative and impactful solutions to preserve our region’s natural legacy for future generations. New connections are formed between a wide variety of guests representing businesses, non-profits, state and local government, recreation groups, and more. 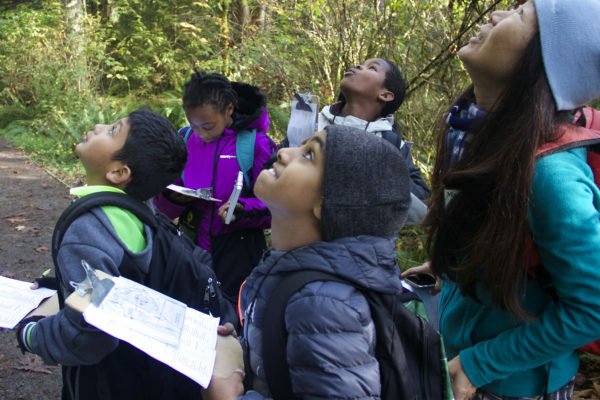 The Mountains to Sound Greenway Education Program teaches 4th-12th grade students in King County schools about the challenge of sustaining a healthy, natural environment in balance with the needs of a growing population. The Greenway Education Program works hard to remove barriers preventing students from accessing the outdoors. Our program fees are based on a school’s percentage of students participating in the National School Lunch Program (a.k.a. “their free and reduced lunch rate”). The higher the rate, the lower the fee. This is only possible due to generous contributions from individual and corporate supporters. Your sponsorship directly creates opportunities for more children to receive high-quality, experience-based science education; many of whom have never before set foot in a forest.